The duo also managed to take out a row of parked cars while they were at it. Ahh Hollywood, the land where the roaring rapids of media industry money run free and water the the seeds of everyone with a talent that people around the world want to see. Many times, as tabloids are happy to tell you, that ends badly. As Los Angeles-based news service KTLA tells us, one of those seeds blossomed, got ahold of a Lamborghini Huracan Spyder, and slammed it into a row of parked cars in North Hollywood before fleeing the scene and leaving cops and neighbors with the remains. The police are now looking for the driver and another suspect, both of which were spotted fleeing the scene after wrecking the beautiful Lambo. Speed was definitely a factor in the crash as eyewitness accounts claim that the Lamborghini was racing a blue Bentley before it hit the parked cars near the intersection of Romaine Street and North Genesee Avenue in Los Angeles. Witnesses then report that the two suspects jumped out of the Lambo and into the blue Bentley that was following before darting off into the night. Local news outlet ANG News elaborated on the aftermath with an Instagram video. In it, the wrecked Huracan can be seen being hauled off by a tow truck. ANG News also claims that the Italian supercar managed to flip over a 2nd Gen Toyota Rav4, one of the unlucky parked cars, before severely damaging the rear end of a Kia Soul parked next to that. Given that nobody was hurt, not much aside from the Lamborghini and two commuter cars were lost. The interesting part comes from a sheriff’s sergeant, who told deputies that they encountered the Lamborghini earlier that night during a traffic stop. 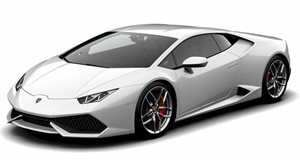 Unfortunately, the nature of a car like the Lamborghini Huracan as well as the people who have enough money to sit behind the wheel of one make instances like these less than surprising. We’ll keep you updated as the story develops.